All membership prices include HST, are based on your age as of January 1st of each year and pricing for couples and families are based on residing in the same household. 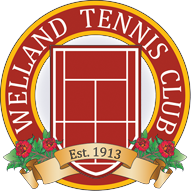 For all adult memberships in 2018, a $20 fee per person will be charged to non Welland residents. Members with a Welland address on their driver’s license will not be required to pay this fee. The outdoor tennis season begins April 1 and concludes October 31st. We now offer the ability to register your information online with a follow up etransfer payment. If you prefer not to send an etransfer, we are happy to accept a cheque or cash payment to the Club Pro or any member of the Board of Directors. Once you become a member, you will receive a three-digit access code to the club. Please do not provide this information to non-members. How are the types of membership determined? Membership levels are based on age and family status. We offer a wide variety of options to get you, your family, and even your friends playing tennis. There is no membership card but you will be provided with a shoe tag that you can provide to anyone if they ask for proof of membership.